We have many samples for you to view at your leisure in our showroom and gradually on our website. you can even mix components from different invitations. When perusing our website please take note of the design number to refer to us. Don’t have time to visit us – that is also perfectly fine. We service NZ Wide (also worldwide). We can work with you via email. We can freight to you where ever you are. Please provide as much information as possible when enquiring for a quote or ordering. or if you make a mistake while writing names on the invitations. Once we have your deposit and your words/design ideas/photos (everything required) we will begin your artwork. Delays can happen if you make many changes, or take days to proof the artwork, also allow extra time if printed proofs are being freighted to you either via courier or nz post. Please do not be offended if you need them sooner than TWO weeks, and we say it is not possible. As it would not be fair to bump our current clients to fit you in – please come in or email your fully prepared information, wording, photos, ideas. If you change your whole design concept after we have designed your first concept you will be charged for a whole new design. Once we have your $ and your words / photos / we will begin your artwork. We will email through a proof to you usually within 5 business days. Any changes can be made, you have up to 3 complimentary proofs that will be emailed to you. If after these 3 proofs you require any further changes these will be charged at $15 per Proof. We cannot be held responsible for any errors or omissions detected after approval for print. Once you are happy with the proof, we like you to see a Printed Proof, you can pick this up, or we can freight this to you for $5 (usually ready within 3 business days). If you require changes AFTER the sample has been made, and/or a new sample is required to be viewed, you will be required to pay an additional charge of $15. Once this has your final approval, please email to confirm, and we will then go to print. If you change your whole design, you will be charged a new design fee. You are most welcome to pick up directly from us. Or we can courier (NZ Couriers) (Courier Post) or post (NZ Post, overseas) to you. Guest Names printed on your invitations for an additional cost or envelopes – Guest Names and Addresses. If you add / amend names after you have submitted them, there will be a charge of $8 each time you change the list. We have various stocks to choose from, our most common are: Matt or Gloss 350gsm, Via Felt, Courier Laid, Metallic, Constellation Snow, Linen, Kraft, Cast Coated (Matt back Gloss front). Please see our Stocks page. 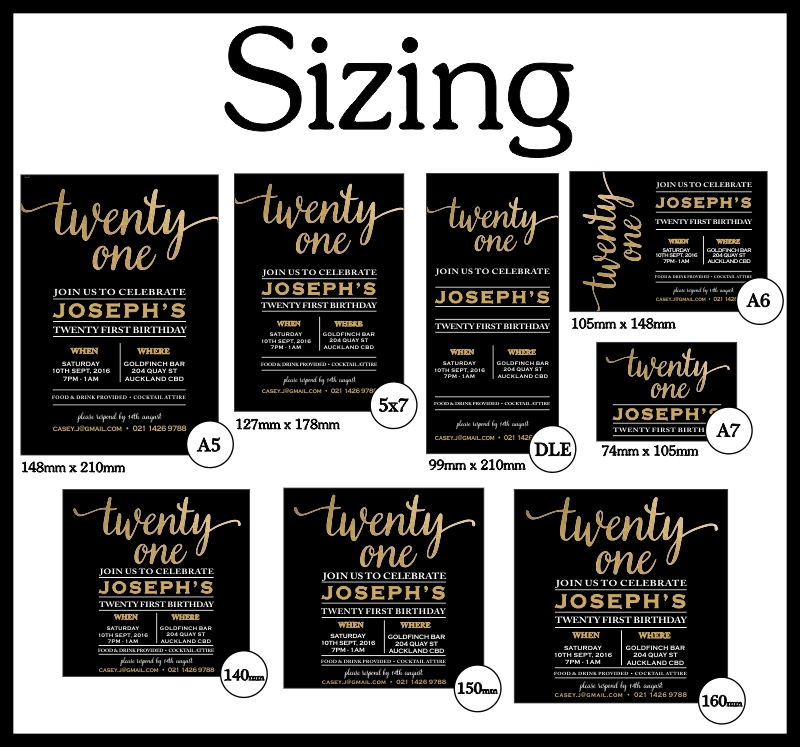 We do recommend that you order extra blank invitations at the time of printing. As it takes considerable time to print and trim and prepare your invitations / printing. Please note our INVITATION ARTWORK FEES include consultation, communication, emailing and proofing, a sample invitation, printing, trimming and assembly if required. (please note we can not sample Foiling, Envelope Printing, Die-Cutting, White Ink Printing – as these processes require expensive setup costs). If the job requires further communication/design than anticipated then this is charged at $15 per 1/4 hour. We will notify you prior to continuing. Unfortunately we are unable to accept a return if you’ve simply changed your mind, ordered the wrong size (sizes are clearly stated), or no longer want the item. We are willing to make compromises though so please don’t hesitate to ask if you do need to exchange an item (there will be a $15 fee minimum (or 10% which ever is great) – to cover – restocking/accounting/creditcard fees. Made to order items or ordered in specifically are not refundable. We will need to inspect the items to make sure that they are in pristine condition for restocking and reselling. Prices are subject to change with or without notice. All artwork , layup and design work is owned by MyCards.